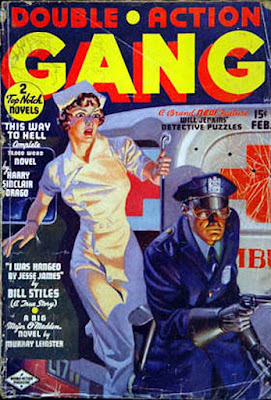 I've never read much from the gang pulps, but this issue of DOUBLE-ACTION GANG looks like a pretty good one, and a bit unusual, too, because most of what's inside it was written by a pair of authors much better known for their Westerns. 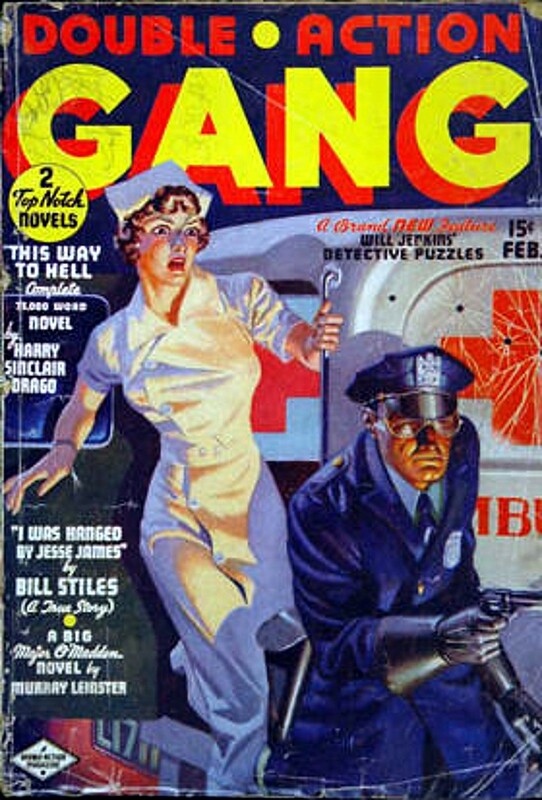 The featured novel "This Way to Hell", which fills up about two-thirds of the issue, is by Harry Sinclair Drago, who had a long, prolific career as a Western novelist and pulpster under his own name and the pseudonyms Bliss Lomax and Will Ermine. The supposedly true story about the Jesse James gang attributed to Bill Stiles is actually by Ed Earl Repp. And there are two stories by Will F. Jenkins, one under his own name and one under his much more famous pseudonym Murray Leinster. While Jenkins/Leinster isn't really famous as a Western author, he wrote quite a few of them. On top of all that, I like the cover. If I actually owned a copy of this pulp, I'd read it, you can count on that. Wildside Press has the four Murray Leinster Megapacks on sale for $0.55. Tempting, however my media consumption plate is full and overflowing. My plate is the same way, but I can't seem to stop buying books anyway! There is apparently some controversy as to whether a "Bill Stiles" of the James gang did indeed die in the Northfield raid, or if it was a confusion of names/aliases. At least "controversy" in the sense of "let's see if we can sell a few True Fact, Really articles to the newspapers and a pulp mag or two; what do we have to lose"?